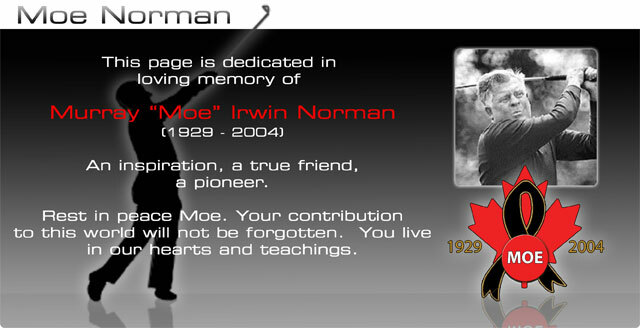 Moe Norman was a Canadian legend and a man revered by golf professionals all over the world as one of the greatest ball-strikers in the history of golf, and certainly one of the most eccentr ic and colorful characters in the annals of sport. The numbers tell the tale: With 17 holes in one, three scores of 59, four scores of 61, and more than 30 course records during his career, Moe Norman dominated Canadian golf through the mid 20th century. An unnaturally shy man, Moe Norman shunned public appearances and speaking. His shyness only disappeared while he held a golf club in his hands. During tournaments, Moe would hit drivers off of 6” tees, soda bottles, and play par 4 holes ‘backward’, hitting a wedge off the tee and a driver onto the green and still make par or better. After a brief stint on the U.S. PGA Tour, these antics earned Moe Norman a ‘dressing down’ by some members of the tour, and he left to never play in the U.S. competitively again. Moe Norman’s accuracy with a golf ball earned him a meager living until 1995. During one of his clinics, Moe hit over 1,500 drivers in a little over seven hours, all of which where within 15 yards of one another. It was this accuracy that eventually earned Moe Norman the respect and notoriety that true genius deserves. In January 1995, Titleist CEO Wally Uilhein decided to pay Moe $5,000 per month, what they called a reverse scholarship” for nothing more than his unique contribution to the game of golf. Presented with the money Moe asked “What do I have to do for it?” Mr. Uihlein replied “You have already done it Moe”. Moe Norman’s genius with a golf club was seen by thousands, if not hundreds of thousands, throughout his lifetime. He often hit balls at the Canadian Open for the touring professionals when the tournament was in town. Moe Norman passed away September 4, 2004 at the age of 74, with hundreds coming to Kitchener, Ontario, Canada to pay their respects to the legend. The story of Moe Norman is intelligently and compassionately told by Barry Morrow, who won an Academy Award for his screenplay for 1988’s The Rain Man. George Gallo, known for writing Midnight Run and My Mom’s New Boyfriend, is set to direct the film. The independently produced movie largely focuses on the mid-to-late 1950s when Norman won nearly every tournament he played and played in two Masters, simultaneously delighting and horrifying the golf world with his eccentricities, excruciating shyness and incredible skill. “This was when he was at the peak of his powers, but Moe was conflicted with hiding behind his insecurities and getting on a na tional stage,” Morrow said. Like Dustin Hoffman’s autistic character in The Rain Man, Norman had a savant-like intelligence. With his photographic memory, he could tell you the exact number of courses he had played (434) and he could figure out mathematical equations with incredible speed. While Moe Norman had completely mastery on the golf course, outside the ropes he was a social misfit. Norman’s life was at times tragic, hilarious and poignant. “He wanted to be the best golfer in the world and not have anyone notice. The press called him a golf clown, the RCGA thought he was an embarrassment, and the PGA Tour pros drove him off the tour because of his eccentricities. Golf was a means to his happiness, but his fears were in the way,” Morrow said. Gallo and Morrow are going to great lengths to ensure that Moe Norman’s character is told with sensitivity and accurately. They have engaged Todd Graves of the Graves Golf Academy, A personal friend of Moe for the 11 years leading up to his death in September 2004, Todd Graves was given the nickname “Little Moe” for his swing likeness to that of the legend. In April 1996 when asked if Todd could teach people his way, Moe replied “Certainly. He’s the only one who knows it. Really knows it. Other guys just think they do.” Todd will act as swing coach for the actor who will portray Moe Norman, and function as his body double.